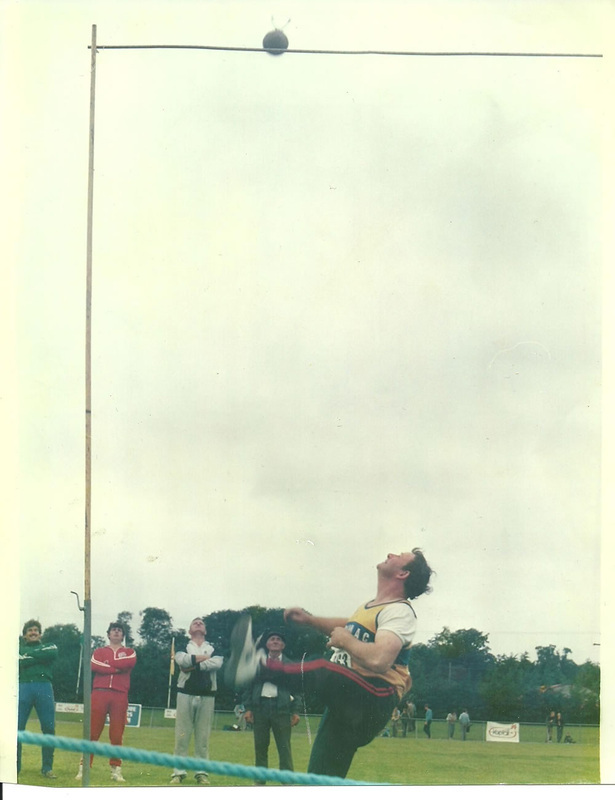 Irish Record Over the Bar 16' 2½"
Crusheen native and Marian AC member, Gerry O’Connell won his first County title in 1964. 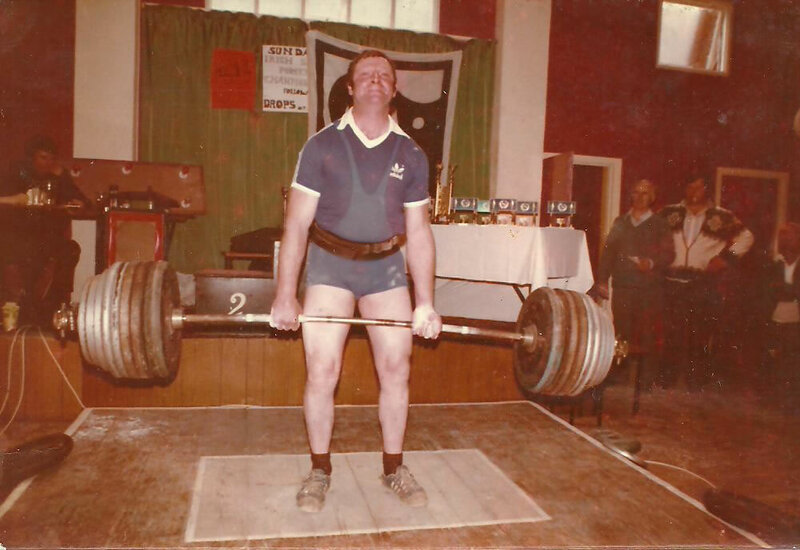 Earlier this year, fifty years on, he competed in the Munster masters indoor championships and won with a throw of 7.72 in the weight for distance event. In Colm Murphy’s book, “The Irish championships”, the author wrote ‘with the retirement of Tadhg Twomey and Len Braham, it fell to Gerry O’Connell to fill the vacuum left in the 56 lbs events. With his height advantage, added to his great strength, it was not surprising that Gerry would dominate the 56 lbs for distance and the 56 lbs for height in the 1980’s. He won no less that six Irish senior powerlifting championships and set an Irish record for the dead lift at 320kg. He holds one Irish junior powerlifting championship and was six years on the Irish powerlifting team. He also won six Munster powerlifting titles. Gerry won seven Munster titles at both height and distance in the 56lbs weight. In the NACAI championships, he won eight titles in al while, with BLE, he won six National championships for 56 lbs for height and seven titles for distance. Gerry’s personal bests in the 56 lbs came at Knocknagoshel in Kerry in the summer of 1982. He broke the 16 foot mark, which would have been a National record, when he lobbed the weight over the bar at that height and later got the weight over the bar when it was set at 3 inches higher. . Throwing the weight for distance, he broke the 30 foot mark with a throw of 30’ and 3”. Neither, however, were accepted as a record as the required steel tape was not present to verify the measurement. Gerry still competes in the Master’s circuit and is a regular at the National masters as well as other throwing events around the country. In 1982 Gerry travelled to Munich and competed in the European and world stone lifting championships where he was placed sixth. Gerry was also an accomplished boxer and he won a Duggan shield, awarded in a Munster v Connacht contest. He also played hurling for his beloved Crusheen for many years. He is, understandably, very proud of his athletic achievements but high on the list of his most memorable sporting occasions are Clare’s Al-Ireland hurling wins and, especially, Crusheen’s Clare senior hurling championship successes. “They were great days, after all the years without success to finally get over the line”, he told the Clare Champion this week when recalling his athletic achievements. He developed an interest in the 56lbs weight after watching his neighbour Jack Harte compete. “I got a 56 lbs from a weighing scale and started”, he recalled this week. Gerry’s first competition was at Kilmaley sports. “The Kilmaley sports used to be held near Gortanaganniv lake. I won the 56 lbs for distance”, he recalled. From there on, Gerry competed in sports meetings practically every week. At the time he was also hurling for Crusheen. “I was lucky not to pick up any injuries as one could easily have suffered a broken finger when hurling and it would have caused problems when throwing the weight”. “There were many days when we hurled and then rushed off to some sports. There were no showers, just a quick wash at a barrel of water. Gerry has many highlights from his career to date and, not surprising, the setting of an Irish record for the 56lbs over the bar, a record that has stood for the past 28 years, tops the list. That record of 16’ 2 ½ “ was set at the National championships in Tullamore. “It was great to set the record at the National championships”, remarked Gerry before expressing surprise that it is still there to this day. “It’s time for someone to break it now”, he quipped. When Gerry took up weightlifting his first weight was the axel from a two horse mowing machine. I used to train at home but later I went to the Garryowen weightlifting club in Limerick where I learned a lot.